Neither player can target this card with monster effects. Once per turn (Quick Effect): You can target 1 face-up monster on the field; it loses 500 ATK/DEF. Your opponent cannot activate cards or effects in response to this effect's activation. At the start of the Damage Step, if this card attacks an opponent's monster: You can place that opponent's monster in a zone this card points to and take control of it, but send it to the GY during the End Phase of the next turn. This monster is the cover card for Circuit Break. This card is Varis' ace monster. This monster appears in the artworks of Tactical Exchanger and Quick Launch. This card's name is a play on the Japanese pronunciation of barrel. This card is the first Link Monster that requires a minimum of 3 monsters to fulfill its Link Materials. This card is the first Dragon monster used by the Knights of Hanoi to be an actual Dragon in the Yu-Gi-Oh! VRAINS anime. Befitting the bullet theme of both Varis and his Rokket Deck, this monster bears several gun-like features. Its main torso for example resembles a cylinder of an actual revolver handgun. Its forearms also resemble revolver barrels. In fact, whenever a rokket monster's effect is used in the anime, they become 'bullets' for this card which shoot out of its barrel-like mouth. 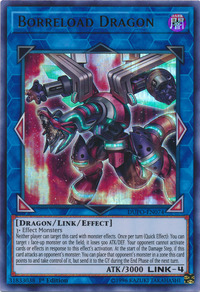 This card opposes Firewall Dragon, as both monsters feature opposing stances and color schemes similar to Red Dragon Archfiend and Stardust Dragon. Furthermore, their effects also oppose each other, as Firewall willingly protects other monsters, while Borreload forcefully controls other monsters before sending them to the Graveyard. Due to this, Borreload can be considered as a rival to Firewall. Similarly, this card opposes Decode Talker, as they also have opposing stances and color schemes in a manner mirroring Red Dragon Archfiend and Junk Warrior. Their effects are also opposites of one another, Decode derives strength from other monsters to empower itself while Borreload weakens other monsters to protect itself and takes advantage of them by forcefully controlling them. This is further implied by how Decode Talker defeated Borreload in the end of season 1 of VRAINS in a manner reminiscent of how Junk Warrior beat Red Dragon Archfiend at the end of 5D's. Lastly, both events involving a skirmish between the two monsters were foreshadowed in the first opening of each respective series. Due to this, Decode and Borreload can be considered rivals as well.